Posted by Eddie & filed under Mountains & hills, Music, Personal, Travel, April 19 2007. On Saturday I went to see Maiden Scotland, an Iron Maiden tribute band with Lesley at the Studio 24 venue in Edinburgh. She has written about it on her blog here. It was a good gig with some great Iron Maiden tracks played the way they should be, and Maiden Scotland really sounded good. The singer particularly brought the screaming Bruce Dickinson vocals off well. I really recommend that any Maiden fan goes to see them play. Standout tracks for me were Fear of the Dark and Phantom of the Opera. My own claim to be a Maiden fan is a bit weak – I was totally into Iron Maiden when I was 15 in 1985, about the time the Powerslave album was released (which is still an awesome album), but soon discovered Pink Floyd and wandered from the true metal path into the wasteland of prog rock. On Monday Lesley drove to Inverness for the day for a work appointment and I cadged a lift off her as far as Aviemore to go walking. I have climbed all the main summits in the region of the Cairngorms near Aviemore and only had a few hours before I got picked up by Lesley driving back, so I walked up to the nearby relatively unknown 824m summit of Geal-charn Mor in the Monadhliath hills. Photographs from the trip can be seen here. This is an easy hill to get to the summit of, with a 4×4 track (that follows the ‘Burma Road’ right-of-way route) that takes one nearly all the way to the summit from the A9 on a gentle gradient. The weather was sunny and warm, and the hills were unusually dry after a prolonged rain-free spell. Although Geal-charn Mor is not a particularly exciting hill, views from it to the Spey Valley and the Cairngorm range were impressive. 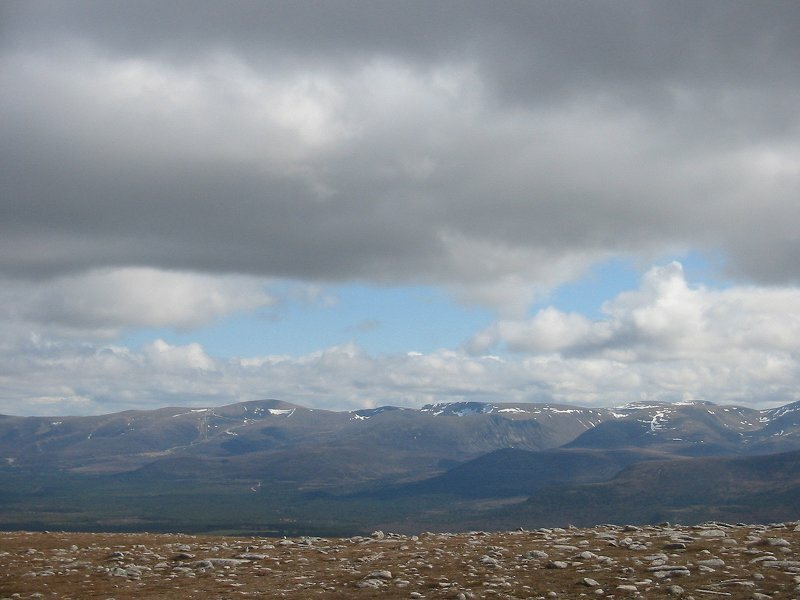 What was striking was the small amount of snow remaining on the main Cairngorm plateaux after what has been another disappointing season lacking in traditional Scottish winter mountain conditions. The extent of the Cairngorm snowfields that remained looked identical to those that I saw in April 2003, that I mentioned in my posting ‘Has climate change already affected hillwalking in Scotland and further afield?‘.